There are several acclaimed hauntings that involve the Old Tooele Hospital in Tooele , Utah . In the year of 1873, a man by the name of Samuel F. Lee constructed the structure in order to provide himself and the members of his family with a place to live. By the year of 1913, the Lee family had moved out of the structure and the county turned it into a home for those that were elderly and required special care and supervision. At this time, many locals referred to it as the “County Poor House”. It was not long before the residents of the county recognized the structure as an appropriate location for a hospital. In this haunted places to go ghost guide, you will learn about the hauntings of the Old Tooele Hospital. The new hospital that opened in the area in the year of 1953 was a structure that was built for what is referred to as the “Tooele Army Depot”. Minor adjustments were made to the building in order to ensure that medical care could be provided to patients that visited it for care. This hospital was found to be a bit more attractive to the residents as the Old Tooele Hospital had no individual restrooms, but rather community restrooms that were limited to one on each hallway. In addition to this, there was no special location identified as a “morgue” for patients that passed away in the structure, though there was one room designated for the dead. The local mortuary would pick up the bodies as time permitted from this location. When visiting the Old Tooele Hospital , you will notice that the Tooele County Cemetery is seated beside the structure – could this have an impact on the hauntings experienced? The Old Tooele Hospital has been the site of many acclaimed hauntings and various types of paranormal activity. You may be surprised to know that two popular movies were filmed in this mysterious structure. The first movie was called “The Fastest Indian”. This movie documented the true story of motorcycle legend, Burt Munro. The second movie filmed at the hospital was “The Stand” by Stephen King which is considered to be a fantasy story based on potential post-apocalyptic events. While these movies definitely brought some attention to the structure, a new hospital that has been hailed as “State of the Art” was constructed in the county and the Old Tooele Hospital was officialy closed for business in the year of 2000. Today, if you visit the structure, you will find that it is used for two different things – half serves as an area for the care of the elderly and the other half serves as “Asylum 49”. 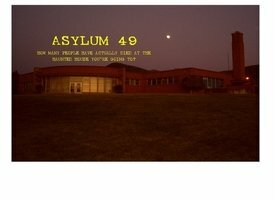 In the year of 2006, a man by the name of Kimm Andersen elected to create “Asylum 49” as an attraction for the youth and other members of the community for Halloween. This attraction is a haunted house theme. Kimm Andersen had a difficult time accepting stories and events that surrounded the paranormal. However, after spending quite a bit of time researching the Old Tooele Hospital, he quickly emerged as a believer that it did appear that the structure had a unique share of paranormal activity. His wife, Rebecca, eventually contacted a man by the name of Troy Wood and an organization of paranormal researchers referred to as the “Utah Ghost Organization” or “UGO”. An investigation was conducted in the year 2007. You may find it interesting to note that a spiritual portal is said to exist at the Old Tooele Hospital . It is said that a nurse by the name of “Maria” guards the portal. The spiritual portal contains a very bright light in which the deceased are highly attracted to. The individuals that have died while being cared for in their old age often go towards this light, believing it is their portal to the peaceful afterlife. However, Maria informs them on “the other side” that this is not the area that they should go to. A psychic medium that toured the facility and did her own investigation confirmed this information. It is said that a patient by the name of Wes haunts the structure. He passed away and seems to be a bit confused and scared. He had Alzheimer’s disease at the time of his death and it is believed that the confusion from this condition continues to burden him in death. He is known to stay in the room that he was assigned to in life as well as the hallway just outside of his room. A medium came in to the hospital and attempted to assist him in “crossing over” as he should in the afterlife, but with no success. She discovered that there is an entity that stays very close to him when he is in the hallway – this entity is described as being very “dark”. There are several other spirits that are said to haunt the Old Tooele Hospital . Their names are Richard, James, Ned, Peter, and even Jessica, who is a young child. These spirits have made themselves known to the visitors, employees, as well as the “Utah Ghost Organization”. These individuals have heard voices, seen apparitions, and experienced events in which these spirits have made themselves known. If you enjoy reviewing evidence of haunted places to go, and would like to experience the evidence of the spirits at the Old Tooele Hospital for yourself, you may review EVPs, ghost pictures, and ghost videos by visiting www.Asylum49.Com and www.Utahghost.org We are sure that you will be absolutely amazed at the evidence listed at these locations! There is another story of interest when it comes to the Old Tooele Hospital . This is the story that claims that the popular Samuel F. Lee continues to walk the floors of this structure in the afterlife. It is said that this man contributed in many generous ways to the community, and people in general and he would like others to know. His son, Thomas, who has been estimated to be between six and eight years old often lingers with his father through the Old Tooele Hospital . He is a playful spirit that thoroughly enjoys people and playing little jokes on the guests. If you look at the picture here, you will be able to catch a glimpse of Samuel. As you can see, when it comes to haunted places to go in Utah , the Old Tooele Hospital is among the most popular. When visiting a haunted area, you must consider how many people have died there…if it is a lot; you are likely to have many unique paranormal experiences. The Old Tooele Hospital has many!